How can I take a screenshot of the Windows 10 Login Screen? 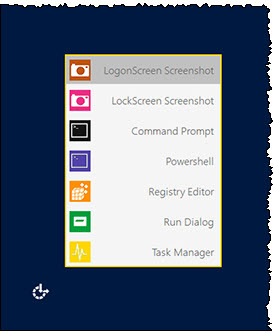 I have read How can I take a screenshot of my logon screen in Windows 7?. Unfortunately, the posted answers reportedly only work for either Windows XP or 7. I've considered using VirtualBox or VMWare as suggested in How can I take screenshots of the PC before it boots up?, but this wont allow me to capture a computer-specific login issue*. The aforementioned question also specifically asked for solutions before the PC boots into Windows. *The "Shut Down" button disappeared from my desktop's login screen, but that's an issue for a future question. Add the Snipping Tool as the Ease of Access button to do the job. 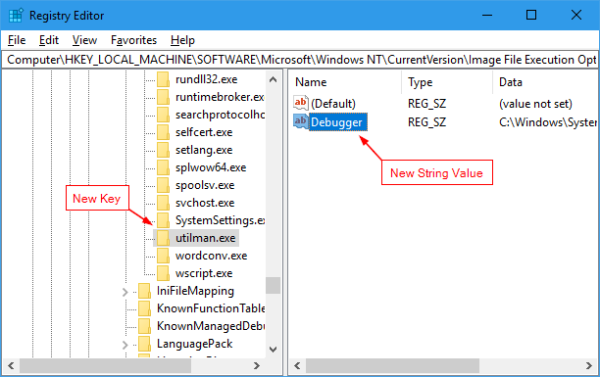 Create a new Key called utilman.exe on the left panel and a new String value called Debugger at the right panel. Then set the path of the snipping tool (see below) as the value of the string. 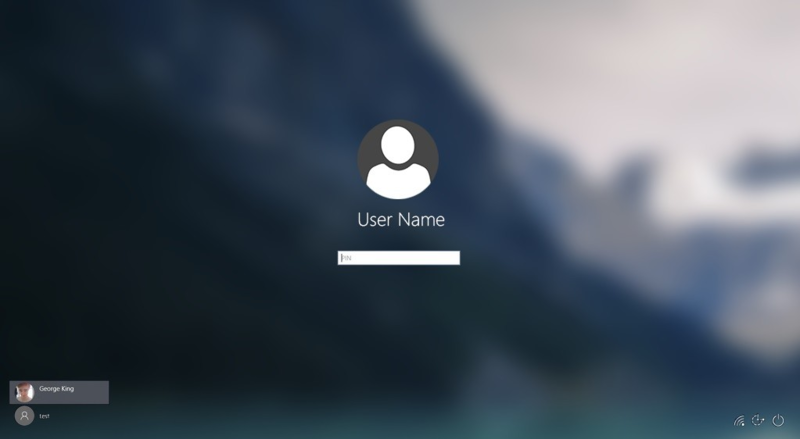 At the Login Screen, Click the Ease of Access button, the one next to the Power button at the bottom right corner of the screen. The snipping tool pops up. Take the screenshot of the Login Screen and click Copy button to copy it to the clipboard. You won’t be able to save the screenshot you just took, but you can still use Clipboard as your middle man to transfer the content. Log back to your desktop, launch Paint app or any other photo editing or screenshot app you use and paste it. If you've got a mobile phone there's a good chance you've a camera in it as well, so that's usually an easy option. You can easily transfer the photo to whatever you want after that. There's a tendency with issues like this to only look at solutions within the problem domain - i.e. you're looking at a way to get the computer to take a screenshot, not looking for a way to get a shot of the screen. I'd be lying if I said I hadn't wasted ages myself trying to get the computer to do something that just grabbing my camera and taking a quick snap shot wouldn't have done way faster. People get tunnel vision on problems and don't look for alternatives. Logon Screen Screenshot : Take a screenshot of the Logon Screen. Logon Screenshots are saved to C:\Screenshots. Connect to your Windows 10 PC from another computer using remote desktop and then use fast user switching to get to the login prompt so you can grab a screen shot. You can also use an external video capture box, but this suggestion may be way too expensive and complicated for what you're trying to do. I tested it on Windows 10 Pro (Version 1703). Not the answer you're looking for? Browse other questions tagged windows-10 screenshot login-screen or ask your own question. How to take a screenshot of Window's secure desktop? How can I take screenshots of the PC before it boots up? How can I take a screenshot of my logon screen in Windows 7? Why are the failing addresses in Memtest86+ higher than my total memory? Screenshot before windows starts: without another computer? How to take a screenshot of the lock screen in Windows 8? How to take a screenshot of the screen of a Surface Pro Windows 10 without login and using a camera? Can I change the way Windows 10 gives names to screenshot? How to clear the pre-login screen in Redstone 4 (Win 10 ver 1803) of all the “tips”?